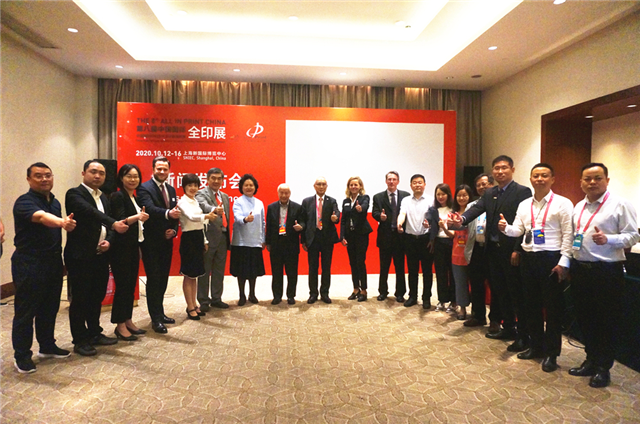 On the afternoon of April 10th, the 8th All in Print China Kick-off Press Conference was held in Dongguan to announce the official launch of All in Print China 2020. Attendees included Mrs. Wang Yanbin - Chairman of the Printing Technology Association of China, Mr. Zhao Pengfei - Dean of China Academy of Printing Technology and President of Beijing Keyin Media & Culture Co., Ltd., Mrs. Chang Xiaoxia - General Manager Assistant of China Cultural Industry Development Group Co., Ltd. and General Manager of Beijing Keyin Media & Culture Co., Ltd., Mr. Axel Bartkus - Managing Director of Messe Düsseldorf China Ltd., Mr. Marius Berlemann - General Manager of Messe Düsseldorf (Shanghai) Co., Ltd., Mrs. Sabine Geldermann - Project Director of drupa, Messe Düsseldorf GmbH. Associations and supporters from the United States, Germany, India and other countries, leaders of over 10 printing associations from Beijing, Shanghai, Guangdong, Hong Kong and others, media representatives from more than 30 professional local and foreign media agencies, and exhibitor representatives from more than 50 leading companies attended the event. 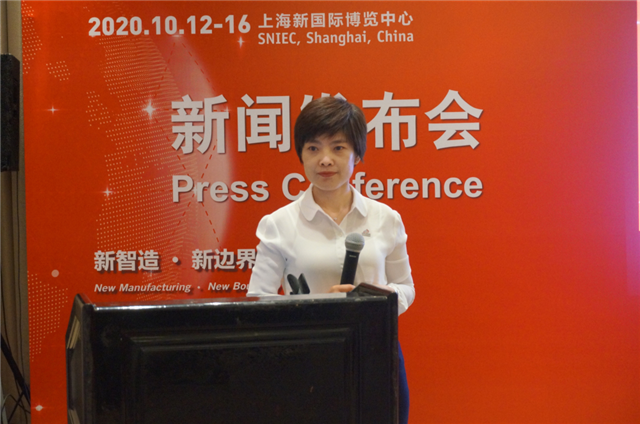 Mrs. Liu Yuping, Deputy General Manager of Beijing Keyin Media & Culture Co., Ltd. presided over the conference. At the Press Conference, Mrs. Wang Yanbin, Mr. Zhao Pengfei and Mr. Axel Bartkus delivered intriguing speeches on behalf of the organizers. 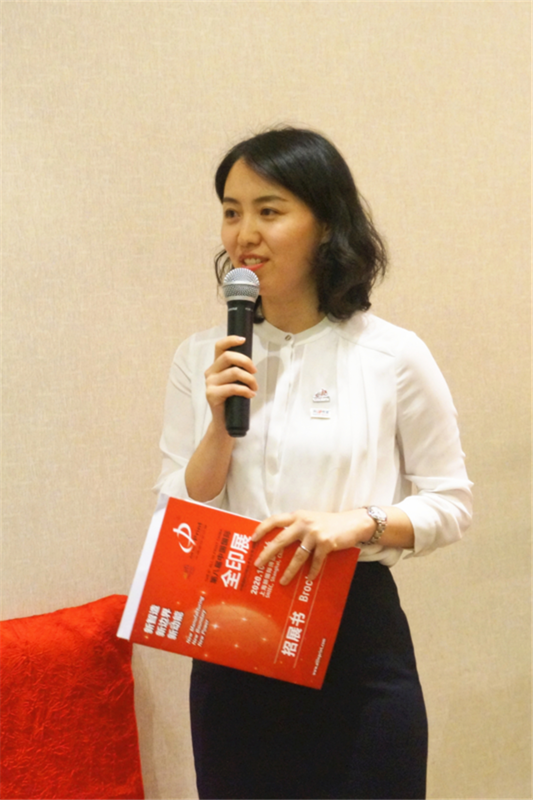 Mrs. Chang Xiaoxia, delivered a recap of the grand success of the All in Print China 2018, explained the new theme of All in Print China 2020, and shared the plans of the 2020 exhibition. 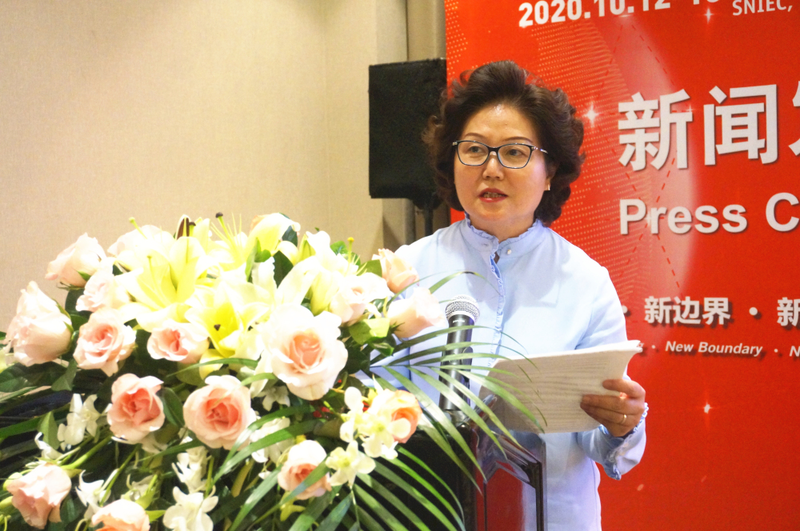 As the strategic partner of All in Print China, Mrs. Sabine Geldermann, Project Director of drupa exhibition, also introduced the innovative cooperation plan between drupa and All in Print China in 2020. 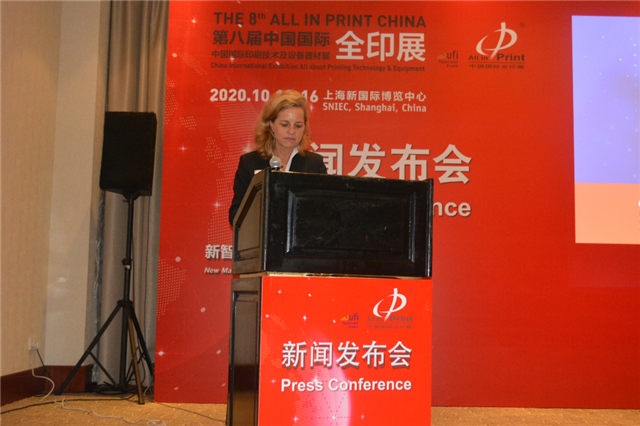 She said: All in Print China has become one of the leading industry exhibitions in Asia. We are proud to promote drupa and All in Print China through our global network. Industry players in the global market now pay more attention to the evaluation of the practicality and quality of the exhibition. Thus, All in Print China and drupa will jointly spare no effort to create new initiatives to make them be must-attend industry events in 2020. Co-organized by the Printing Technology Association of China, China Academy of Printing Technology and Messe Düsseldorf (Shanghai) Co., Ltd.; and undertaken by the Printing Technology Association of China, Beijing Keyin Media & Culture Co., Ltd., and Messe Düsseldorf (Shanghai) Co., Ltd.; All in Print China was founded in 2003 and has successfully completed seven editions. The 7th All in Print China exhibition was successfully concluded at the end of October 2018. The exhibition area reached 110,000 square meters. A total of 1,030 leading Chinese and foreign brands joined hands to showcase their products on the same stage. The number of domestic and overseas visitors reached 100,933 people. All these numbers have created a new record in All in Print China history, making it the largest comprehensive printing exhibition in the world in 2018. At the same time, the number of domestic & overseas group buyers, the level of professionalism of the visitors, and the impact of the exhibition; all these factors have been recognized by the exhibitors and they were all praises of the organizers. Now when China's printing industry accelerates the development of intelligent production, it has comprehensively demonstrated the progress and development trend of printing technology in recent years. 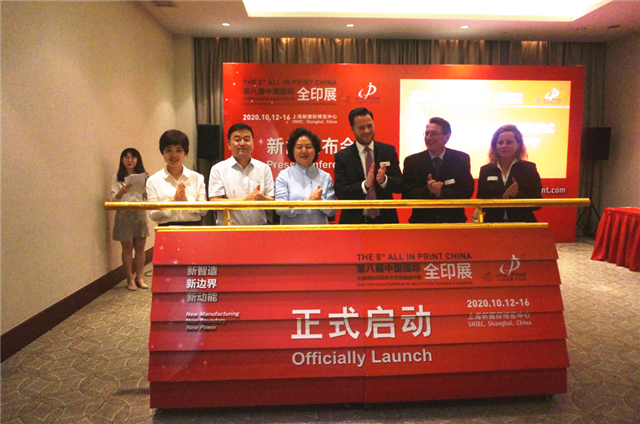 The 8th All in Print China will be held in Shanghai from October 12-16, 2020. With 9 exhibition halls and 110,000 square meters of exhibition area, All in Print China will continue to meet you again at Shanghai New International Expo Center with its mega scale and excellent quality. 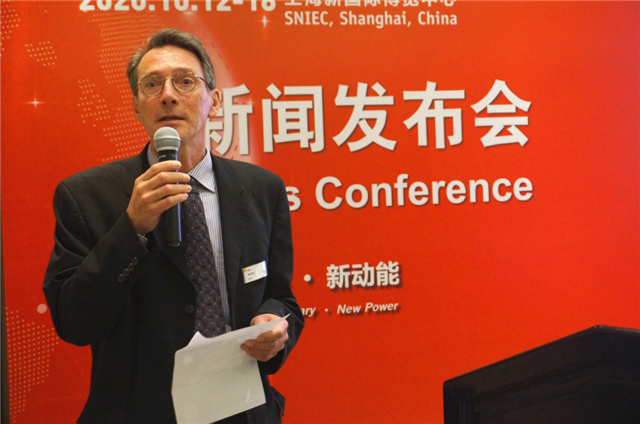 The theme of All in Print China 2020 is “New Manufacturing, New Boundary, New Power”. Riding on the previous theme “Enter the Era of Intelligent Printing”, All in Print China continues to track and promote the intelligent process of the printing industry and explore the deep integration of printing technology and the entire industry supply chain. “New Manufacturing” is the perfect integration of the manufacturing and service industry. It is pointed out in the “Made in China 2025” plan that China’s manufacturing industry is expected to achieve significant progress in digitization, networking and intelligence in 2020. The intelligent printing industry has kicked off. Suppliers and printing companies have transformed their printing and manufacturing production into “intelligent printing” through business networking, production intelligence, process standardization, management digitalization, and cloud printing. “New Boundary” reshape the business model. The development of technologies such as Internet of Things (IoT), Artificial Intelligence, and 5G has facilitated an industrial transformation and increased market competition. Technological innovation and competition have led to the emergence of horizontal cross-border applications, and new species have been introduced. Industry boundaries will be redefined. A new round of commercial revolution will take place in the printing and packaging industry. “New Power” is a new impetus for economic and social development, new technologies, new industries, new industry formats and new models formed in the latest round of scientific and technological revolution and industrial transformation. Traditional power not only involves high-energy-consumption and high-pollution manufacturing, but also covers the first, second and third generation industries that operate under traditional business models. The printing industry is undergoing a transition period of “new and old power”, and All in Print China 2020 will open a new chapter to foster a new development momentum and transform and upgrade traditional energy. 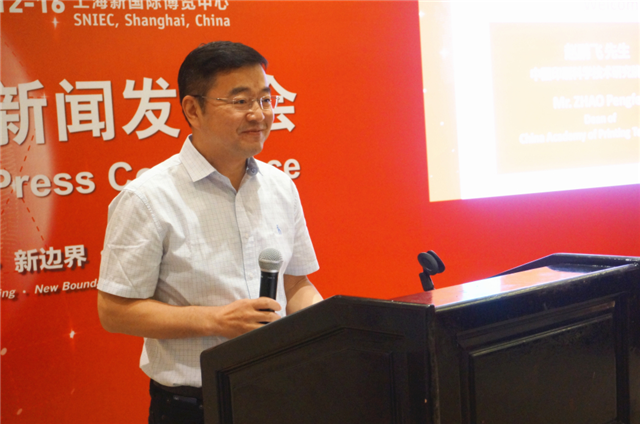 Wide coverage of themes – All in Print China 2020 sets up seven major theme pavilions: Digital Pre-press Pavilion, Comprehensive Printing Pavilion, Post-press Converting Pavilion, Packaging Equipment Pavilion, Ink / Innovative Materials Pavilion, Label Industry Pavilion, Comprehensive Packaging Pavilion. (2) Continue to strengthen the service advantages of All in Print China, provide one-on-one dedicated personal communication about the exhibition; the organizers, exhibition venue provider and service providers work together closely to provide strong participation guarantee; set up public service facilities (news broadcast room, public signing station, etc.) to provide exhibitors with convenience for meeting media and customers. (3) To strengthen the facilitation of business commerce, the organizers will use its global network to expand global buyers' invitations, accurately invite Chinese industry buyers, invite upstream end users, and optimize online trade communication tools to ensure the effectiveness of building trade connections. (4) Make full use of the technology platform, intelligently customize the visiting experience, upgrade the online exhibition through cloud computing, big data, mobile internet, and enrich the mobile exhibition hall with AR\VR technology. At the end of the Press Conference, under the observance of the industry colleagues, the representatives of All in Print China organizers announced the launch of All in Print China 2020 preparations and look forward to meeting you at the 8th All in Print China in 2020, the "Oriental Grand Festival" of the global printing industry. Kind reminder: The booth application system of All in Print China 2020 will be officially online on April 16, 2019, so stay tuned! Established in 2009, Messe Düsseldorf (Shanghai) Co., Ltd. (MDS) is a subsidiary of Messe Düsseldorf GmbH, one of the world’s top 5 exhibition organizers. MDS is committed to introducing industry leading trade fairs to China and providing Chinese and international customers with superior exhibition services. MDS is successfully holding more than 20 leading trade fairs and conferences in China, covering a broad range of industries including printing, packaging, wire and tube, plastics, renewable energy, medical devices, retail, safety and health, wine & spirits and caravanning. With a workforce of some 70 fulltime employees, the company’s head offices located in Shanghai with a branch office in Beijing. The worldwide outbound exhibition business (trade shows in Düsseldorf, Germany and other leading Messe Düsseldorf Global Shows) is organized by Messe Düsseldorf China Ltd. (MDC), serving Chinese exhibitors and visitors with superior customer service from its office in Hong Kong. 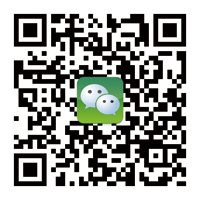 Visit www.mds.cn for more information.